Elsie the Cow was Borden's milk mascot. Apparently Borden introduced a number of different cows in 1936 in a series of newspaper ads. In 1939, Elsie became the full time spokescow. Lani Moo is Meadow Gold's mascot. Orange Juice Bird was a mascot for the Florida Citrus Growers Association. This character was created by Disney for the Florida Citrus Growers around the time Walt Disney World was opening in Florida (1971). He appeared in TV commercials with Anita Bryant. There was also an audio animatronic (robot) version of the bird at Walt Disney World's Magic Kingdom located in the Adventureland section of the park (located at a snack stand). Donald Duck began appearing on orange juice back in 1941. Donald is Disney's tempermental cartoon duck. The Sunkist Kids were a young boy and girl who were very happy with their oranges. Miss Tropicana represents Tropicana Orange Juice. Lady Chiquita is a dancing banana with a headful of fruit. The Brazilian entertainer, Carmen Miranda, is synonymous with this logo. More information can be found at the Chiquita Home Page. Bobby Banana is a skateboarding banana youngster with red sneakers. Introduced between 1971 to 1973, Milton the Toaster is a friendly talking toaster. Of interest, Milton the Toaster was voiced by William Schallert (who played Patty Duke's Dad on "The Patty Duke Show"). 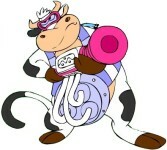 Uder first appeared in 2006 as a cosmic cow with a Schwarzenegger voice. He fires cows milk at Coco Pops, Rice Krispies, and Frosties cereal to fuse the cereal with the milk to create cereal bars. "Milk it". Poppin Fresh, the Pillsbury Doughboy, was born in the mid-1960's. He has bright blue eyes, a nice smile, a fat tummy, and wears a baker's hat. This highly-recognized mascot giggles when his tummy is touched. Poppin Fresh has a wife, Poppie. His dad is Grandpopper and his mom is Grandmommer. The Munchkins were crazy little doughnut holes. Lil' Orbie is a small astronaut, and Orbie is a baby duck. Aunt Jemima Waffles are "for kids who like a square meal at breakfast". Professor Goody, a balding man with a big white mustache and glasses, would go great distances to avoid having to share his waffles with Wallace the Waffle-Whiffer, who was a tall, crazy, out-of-control, bird-like critter with a long and sensitive nose. Of course Wallace would locate the Professor and his waffles, go into a fit and shout "Waffle, waffle!". "Is there a waffle-whiffer in your house?" Bill Scott voiced Wallace the Waffle-Whiffer while Daws Butler did Professor Goody. 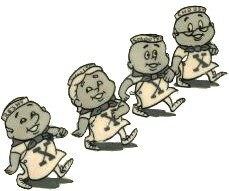 Aunt Jemima Waffle Characters: Aunt Jemima, Wallace the Waffle-Whiffer, and Professor Goody. Aunt Jemima Quick Grits (2001). Western lawman Marshal Mallow wore a yellow coyboy hat and a white marshmallow star. It appears he may have roped in the bad guys. His hot chocolate mix featured marshmallow-shaped stars. What are pancakes and waffles without Mrs. Butterworth's syrup and friendly smile? This Land O'Lakes character is officially known as the Indian Maiden. She has not been given another name. According to the official Land O'Lakes website, the Indian Maiden was created during a search for a brand name and trademark. "Because the regions of Minnesota and Wisconsin were the legendary land of Hiawatha and Minnehaha, the idea of an Indian maiden took form. In 1928, Land O'Lakes received a painting of an Indian maiden facing the viewer and holding a butter carton. Lakes, pines, flowers and grazing cows decorated the background. That painting inspired a new design for the butter carton, and remained until the spring of 1939, when it was simplified and modernized by Jess Betlach, a nationally recognized illustrator. Fifty years later, with only minor changes, his design continues to capture the goodness and quality of Land O'Lakes products". The Merry Millers, circa 1950's, included Freshy (on far left) and Choosey (on far right). Whitey and Smoothy are in the middle. [Thanks to Joe Smith for his research on these characters]. Disclaimer: This is a non-commercial site with the sole purpose of assisting visitors in locating information on their favorite breakfast cereal characters. All of the names, characters, brands, and icons listed here are trademarks of their respective parent companies and cannot be used for commercial purposes. Lani Moo is a trademark of Meadow Gold. Bobby Banana is a trademark of Dole. The Chiquita Banana Lady is a trademark of Chiquita. Donald Duck is a trademark of Disney. The Pillsbury Doughboy is a trademark of Pillsbury. Eat Dole and Chiquita bananas. Eat Pillsbury Toaster Strudel. Drink Milk and Orange Juice. Eat Lil' Orbits and Dunkin' Donuts. Enjoy Aunt Jemima Waffles, and Mrs. Butterworth syrup. Support your favorite characters! Most of the non-icon images on this site have been painstakingly removed from cereal boxes or original advertising cels and enhanced for your enjoyment. You are welcome to link to this pag e, but please do not link to any individual images or borrow any images for use on another website. Thank you.